DC Harvest, a New American restaurant specializing in fresh and local ingredients, is hoping to open by the end of August at 517 H Street, NE. Brothers Arthur Ringel (head chef) and Jared Ringel (General Manager) plan to have a seasonally rotating menu that will focus on ingredients from the Chesapeake Watershed Region (you can read more on the Ringel brothers’ impressive culinary backgrounds from our friends at the Washington City Paper). They are currently in the finishing stages of a complete renovation of the space and hope to pass final inspection and begin staff training in the coming weeks for a grand opening towards the end of August. In the coming days, the exterior of the restaurant will get a completely new paint job in addition to a brand new sign for the restaurant. 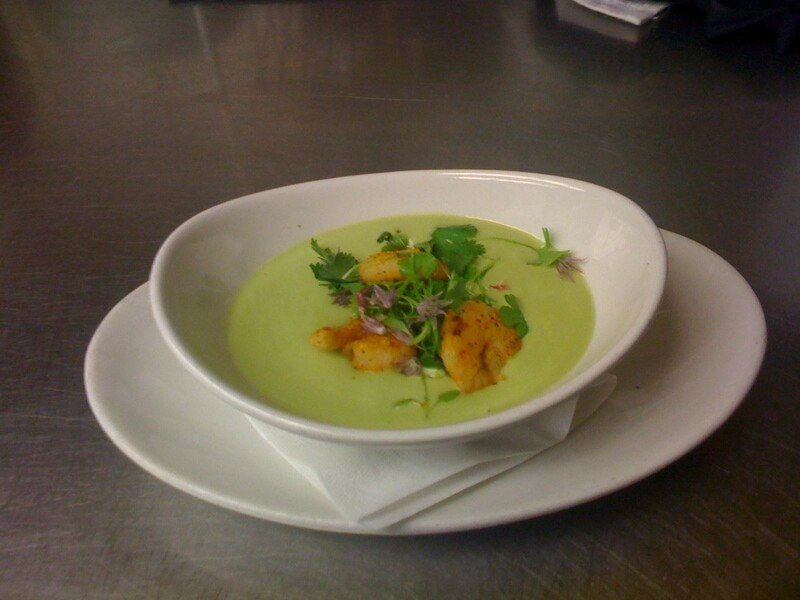 Appetizer – Chilled Avocado Soup with pickled shrimp. Garnished with micro cilantro and fresh radish (see picture above). Pasta – Fresh Homemade Kale/Whole wheat Agnolotti filled with homemade Ricotta served with yellow tomato confit, eggplant and fresh marjoram. Entree – Zatar seasoned Turkey Breast with kamut, shitake mushrooms, swiss chard, pan jus and garnished with crispy turkey skin cracklings. Additionally, we were told that everything will be made in house and from scratch and that homemade pastas will be a staple of the menu. They chose the turkey breast as opposed to chicken because it was a healthier protein that they knew they could source locally. DC Harvest will feature several local DC brews and will be giving each DC brewery a selection on tap.